Oh dear! this picture shows far more damage than I realised! The organ was at the far end so maybe, as I believe, it mostly survived. 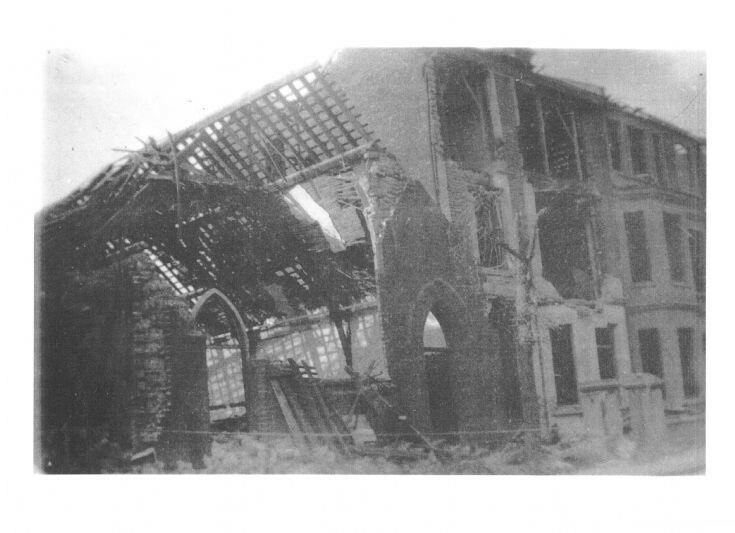 This photo is probably of the damaged church hall, rather than the church building itself. It was the original church which was later used as a hall after the 'new' church was built. The Baptists came every Sunday morning to worship with us, the Methodists, for several years after the bombing of the church. My father was the organist at the Baptists... Clifford John Whtehead, ARCM, no less. My parents were living apart so he was considerate enough not to come with them, as my mother was the choirmistress at the Methodist church! His main concern was the survival of ',his' organ, and indeed it did survive, I believe he did a lot of work to protect it from the elements! Iremember going to a service in the restored Baptist Church soon after war, though date eludes me. I believe it was a celebration of the reopening. The Church has now been turned into flats, though the façade remains. The Methodist church was sold to Sikhs, and now has a golden dome! At least it is still being used for worship. On a recent visit I saw that the High Road now has no shops, just blocks of flats. The house and beautiful garden of 'Langtoft', the home of our good friends Tom and Agnes Stebbings, has gone completely, as has the Undertakers' shop and the Northern Star pub, which stood on either side of our Methodist Church. !